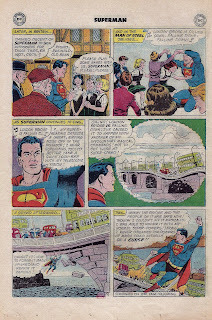 Kav and I are doing our best to survive this Silver Age Superman issue #171 where what he says (or thinks) comes true. Too bad I can't use that magic to make this story more enjoyable. Read on, dear fans! Did you miss PART ONE of this series? Click here to catch up with the series. KAV: Cor! Supey's in the jolly old UK! He needs to take a workshop on how to say 'No'. So he starts playing with the kids, and of course the main thing on his mind should be watch what you say, like, what if he went in a nightclub and said 'Boy this place is dead', but he has the attention span of an infant. It blows me away that the writer just creates rules at will for this story. We see that Superman can't use his magic to un-do what he's done-like saying 'London Bridge is fixed'. TONY: Too bad Fergie didn't show up when Superman was singing 'London Bridge'. Something else would have happened and I wonder if Supe's would have to use his "normal super-powers" to take care of Fergie's "situation". *Wink-wink*. OK, let's get back to the comic. Kav, you'd think Jerry Siegel, the writer, would have delivered a better story. First, we have the stereotypical London slang, which is over the top. We get it, Jerry, Supey's in jolly ol' London. Thank goodness you had him there instead of somewhere in Africa or Asia because we'd be in for a taste of the non-PC Silver Age Era. 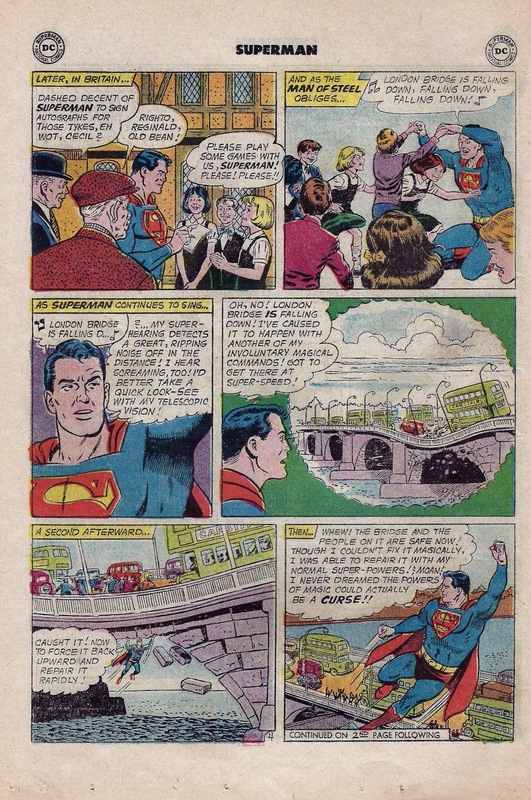 Also, I have to point out that London Bridge falling down was not due to Superman's "involuntary magical commands". That dope knew the rules and ignored them. Why not think, "Gee, I wish there was world peace" or "World starvation will end now!" KAV: Here we have the only Hollywood production company that has never done fake rain before. Pretty much 100% of the rain you see in movies is fake-but these jokers have never heard about this. 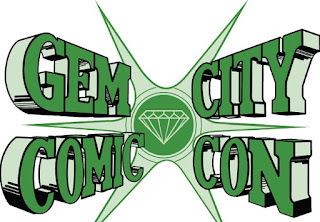 TONY: That was one of the worst pages I have reviewed for Kav & Tony Break It Down. We've reviewed some god-awful pages and this one might be the worst. Kav's right about the fake rain, but what idiot puts their crew in danger by having them filming in some tropical location during monsoon season? That child actor, Baby Darlene, must love standing in the rain all day. I'm sure that exposing her to those elements won't bring on any serious diseases. I bet if that director was given the green light to direct the Wizard Of Oz, he'd have Judy Garland standing in the middle of a Kansas field while an E-F5 tornado comes towards the set. 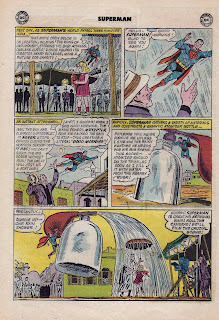 Don't even get me started on the giant bottle Superman created "using a variety of materials". Hey dimwit, you can THINK of rain and it will rain. Ugh! 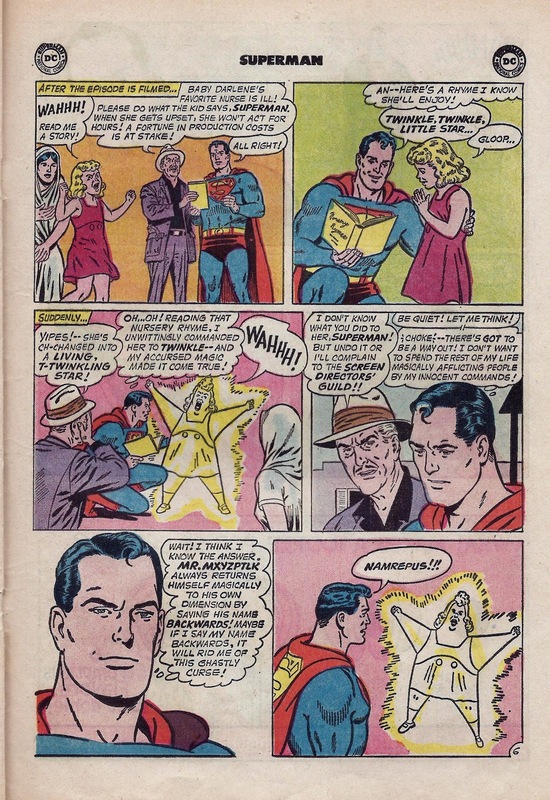 KAV: Ok, Superman turns a little girl into a 'star'....but wait a minute-isn't a 'star' a giant fusioning ball of hydrogen? Ok whatever-then the director threatens to complain about Superman to the SCREEN DIRECTOR'S GUILD! Oh No! Uh, dumbass-Superman's not a member of that guild so they have no say in what he does. PS that star girl is really creeping me out. TONY: Baby Darlene would be perfect for Toddlers and Tiaras. Instead of thinking, "I wish Baby Darlene were happy", Supe's is forced to read her a nursery rhyme. Really? 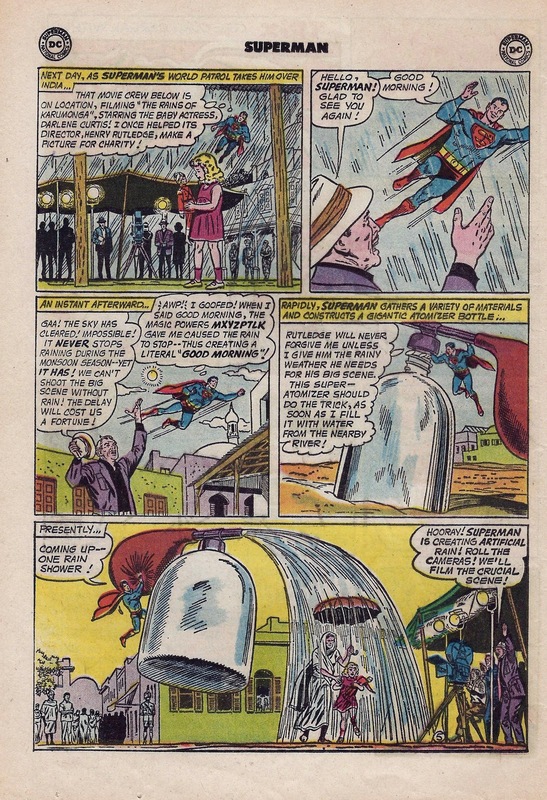 Superman can create a giant bottle of water out of various materials, so why can't he create something to appease the child star from hell? You're batting a big fat ZERO with this issue, Jerry. 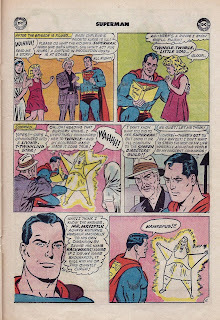 KAV: Superman comes up with a perfect solution-he says his name backwards. This story has more plot contrivances than a Spy Kids movie. Unbelievable. Uh-I mean 'Blimey'. TONY: Thank God! The last page is here. 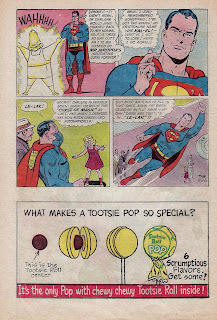 Superman didn't know that his name was Kal-El? Good grief, this was awful. Jerry must have written this one on a Monday morning or Friday afternoon. Have no fear, fans! Kav and I will be back next week with another exciting adventure!